There’s a tendency in tech to think that higher numbers are better. After all, the iPhone 7 is better than the iPhone 6, right? So it would seem that Category 6 cable would be better than Category 5e cable in every single case. First, let’s talk about the difference between Category 5 and Category 5e, also called Enhanced Category 5. There’s a big difference here — Category 5e will support “Gigabit Ethernet” or 1000BaseT which is the current networking standard, while Category 5 just isn’t built for it. Luckily, pretty much every cable made today is Category 5e, even if it just says it’s Cat 5. 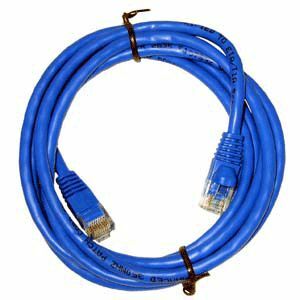 On the other hand, Category 6 cable is made to withstand the rigors of 10-Gig Ethernet, which is a standard used in some businesses for super-fast network transfers. It’s not likely to cross over into home use since Gigabit Ethernet is already 20-50 times faster than most people’s home internet connections. If you can’t connect to the outside world at that speed, what’s the point? As a matter of fact, plain old Category 5 cable will do a great job of handling the fastest internet connection you’re likely to have. Even Category 4 cable which isn’t sold today will handle a 15 megabit connection. Think about that. If you’re planning on putting all your cable in the walls where it might stay for 10 years or more, you’re certainly forgiven for thinking that Category 6 is a better choice, and it probably is since you just don’t know what you’ll be doing a decade from now. All that said, you’re probably just as safe with Category 5e for a while. Oh by the way, in case you were wondering, there’s already a Category 7, but it’s more about shielding and less about speed, so it’s ok not to even worry about it for a long, long while. Back up your stuff. No matter how you do it, it’s better than nothing.